Ask Away Blog: Don't Forget to Sign Up and Promote Your Blog for My Blogiversary Cash Giveaway in August! 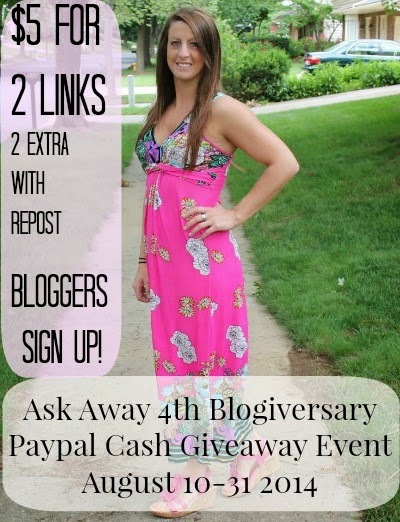 Don't Forget to Sign Up and Promote Your Blog for My Blogiversary Cash Giveaway in August! Don't forget!! On August 10th it's Ask Away's 4th Blogiversary and to celebrate I wanted to hold a Paypal Cash Giveaway. If you want to sign up, please do so using the form below. Sign ups are open until 7/31. Great giveaway- I just signed up! Got your registration! Thanks for signing up! !